It’s the 1st and only chili garlic sauce cooked in Olive Oil to a Perfect Crisp, bringing out its Unique ï¬‚avor. It is a Healthy and Spicy delicacy made of only the freshest of Garlics, Chilies and Spices. With Germano’s Chilli you get the Health Beneï¬ts of its 3 main ingredients: Chili which increases metabolism & energy level. Garlic which lowers cholesterol and reduces Blood Pressure. And Olive Oil the healthiest cooking oil that repairs plaque in our arteries. The combination of this 3 Healthy ingredients makes Germano’s Chilli a Healthy Choice for your Gastronomic needs. Germano’s Chilli goes superbly well with any dish you would like to spice up... from steaks to breads to soups and salads. 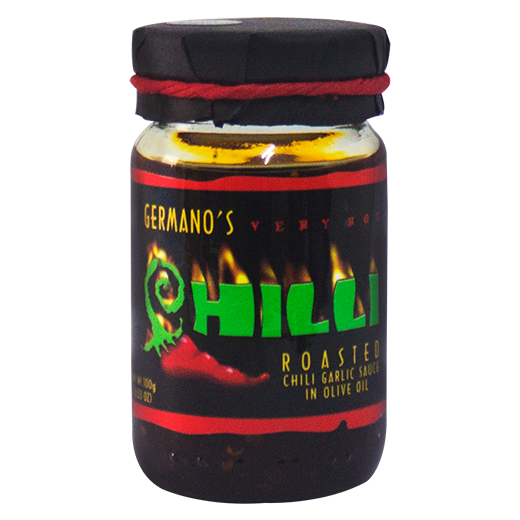 Germano’s Chilli can be used both as a condiment and for cooking. It is a serious cook’s best kitchen companion and a food lover’s best friend.